Using Google AdSense is a popular way to display content-relevant text or image creatives on your website, and to earn ad revenue. It’s often the first ad program used by site owners running Revive Adserver. AdSense tags will often be implemented directly into a site’s HTML code, for example by pasting them into a site template or theme. While this works perfectly fine, it does limit the ability of the website owner to include other campaigns from time to time. For example, if a paying advertiser wants to run their ads on the site for a few days or weeks, it would involve removing the AdSense tags and implementing the advertiser’s tags, and to revert to the situation at the end of the paid campaign. Using Revive Adserver will provide flexibility and control. Ad rotation so you can easily try many ad networks at once. Click-tracking reports so you can see how well your AdSense creatives are performing compared with other ad networks. Targeting options so you can decide who sees which ads, for instance showing one network to US visitors and a different network for European visitors. Campaign priorities so you can give preference to valuable ad campaigns when they are available. Campaign performance goals so when you get your first direct advertising deal you can be confident of delivering it to schedule. This guide will take you through the process of loading your Google AdSense ad tags into Revive Adserver. Navigate to the Inventory tab in Revive Adserver. Click Create new advertiser to add a new advertiser. Save the new advertiser by clicking the Save Changes button. 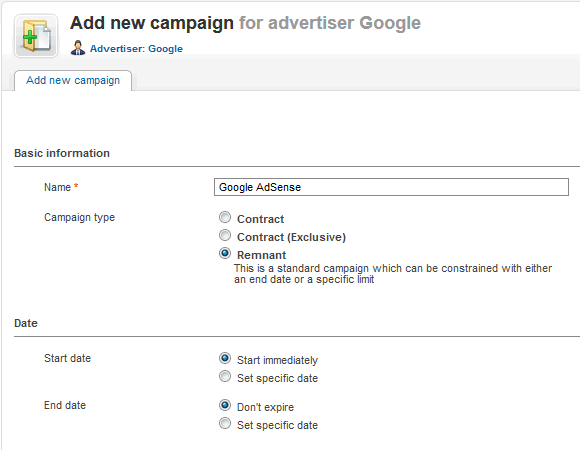 On the Campaign Overview tab of the advertiser, click Add new campaign. Save the new campaign by clicking the Save Changes button. In the Banner overview of the new campaign, select Add new banner. Then select Generic HTML banner from the banner type drop-down. The layout of the screen will change to reflect the selected banner type. Name the new banner accurately, so that you can more easily recognize it later. Consider using a name like “Google AdSense – 160×600” or “Google AdSense – Wide Skyscraper” (or equivalent names for other dimensions). Paste the ad tag you copied from the Google AdSense account into the text field. Make sure to select “Do not alter HTML”, so that Revive Adserver will not attempt to alter the code and insert a click tracker macro. This is not supported by Revive Adserver and not allowed by AdSense program policies. 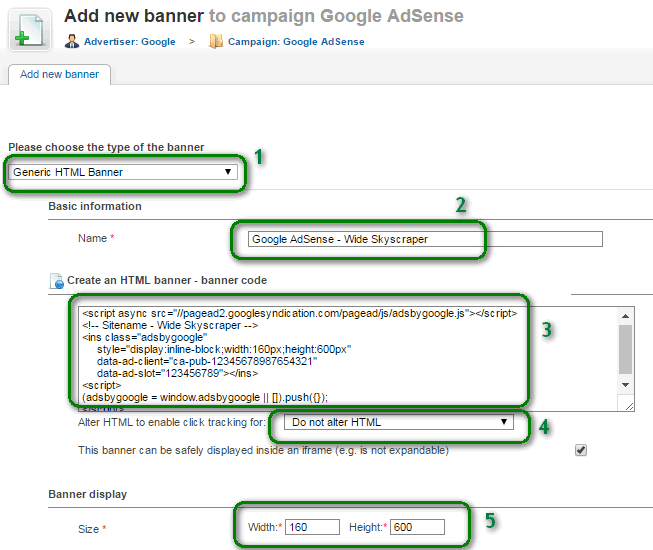 Set the dimension of the Revive Adserver banner to match the dimensions of the Google AdSense tag you created. You must set a size in order to properly link the banner to a zone of the same size. Save the new banner by clicking the Save Changes button. Repeat the process for any other ad sizes you might need.